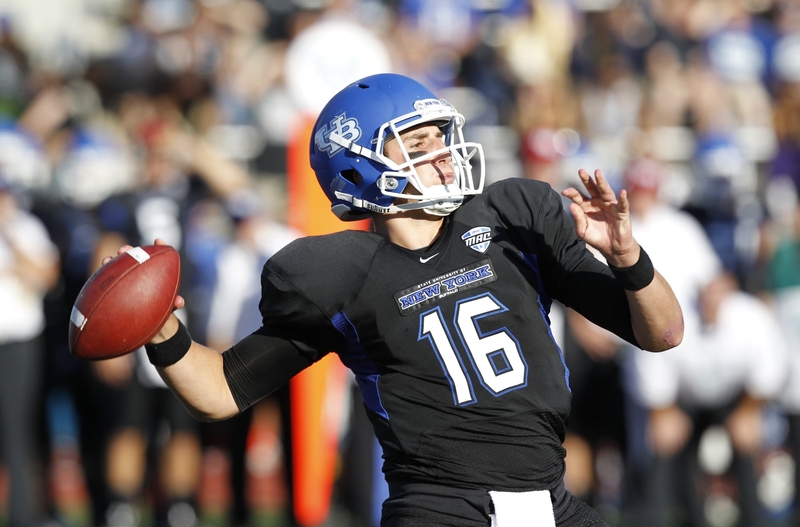 UB is looking to for offensive weapons to go with quarterback Joe Licata (16). The University at Buffalo will open spring football practice Wednesday, the first of 15 workouts leading up to the April 19 Blue/White Scrimmage at UB Stadium. Coach Jeff Quinn, now entering his fifth season, is coming off an 8-5 campain and the second bowl appearance in school history. His mantra since taking over in 2010 is, “Next Bull In,” and that’s certainly true this spring with so many familiar faces departing. 1. Who will emerge as a playmaker to help QB Joe Licata? With the loss of record-setting tailback Branden Oliver and wide receivers Alex Neutz and Fred Lee, the Bulls are in desperate need of offensive weapons. One of those will undoubtedly be sophomore wideout Boise Ross, the lone true freshman on the offensive depth chart a year ago, whose speed is top end. Other candidates are junior tailbacks Anthone Taylor and Devin Campbell, who played in the slot last season. Tailback James Potts is not listed on the spring roster and could be an academic casualty, according to a source. Of course, it wouldn’t hurt if Licata can find multiple options to work with, both in the passing game and running the ball. 2. Where is the pass rush going to come from? UB led the MAC in sacks with 38. MAC Defensive Player of the Year Khalil Mack — who led the team with 10.5 — is gone as are Colby Way (five), a third-team All-MAC pick, and Beau Bachtelle (3.5). So that means whatever progress the Bulls make with the pass rush must come from previously unheralded players with the exception of senior outside linebacker Adam Redden, a third-team All-MAC selection who registered 4.5 sacks as a junior. Senior end Tedroy Lynch (2.5) and sophomores Brandon Crawford (one) and Max Perisse have limited experience. An intriguing prospect is sophomore outside linebacker Jarrett Franklin, a one-time state champion wrestler, who finished his freshman year with 21 tackles — and 1.5 sacks. 3. What will the secondary look like at the end? While finding replacements for playmakers Branden Oliver and Alex Neutz is the biggest question mark on offense, a depleted secondary is the chief concern for the Bulls defensive coaches entering spring after graduating three starters. Finding a replacement for Najja Johnson as UB’s top corner will be key although the options are plenty. There will be others coming in over the course of summer training camp, but the Bulls could have seniors Cortney Lester and Dwellie Striggles starting at corner with Marqus Baker in the mix. Both safety spots are up for debate with the loss of starters Okoye Houston and Derek Brim and reserve Tomarris Bell. Senior Witney Sherry should get the nod at free safety but he will be challenged. 4. How will the players adjust to the new staff members? Programs that experience success tend to lose coaches and UB had to replace three in quarterbacks coach Don Patterson, Jappy Oliver on the defensive line and Maurice Linguist in the secondary. The system on both sides of the ball will remain in place — offensive coordinator Alex Wood (who will also coach the quarterbacks) and defensive coordinator Lou Tepper both return — but there will be a period of adjustment with Chris Cosh on the defensive line and Eric Lewis in the secondary. 5. Where will the leadership come from? Mack, Oliver, Way and Neutz aren’t walking through that door, so new leaders will have to emerge. There are plenty of upperclassmen to fill the void, but the locker room presence of Mack and the others will be difficult to replace.